As I was surfing through channels(bored as hell) I came across a video by Ayo, ‘Down on my Knees’. Well, my hands froze on the remote as I became enchanted by her soulful voice with a mix of reggae beat. The video is also as captivating as its shot in a room(soft board made) in the middle of a savannah. I quickly jotted down her name for I planned to know they new artist breaking into the Neo-soul scene. 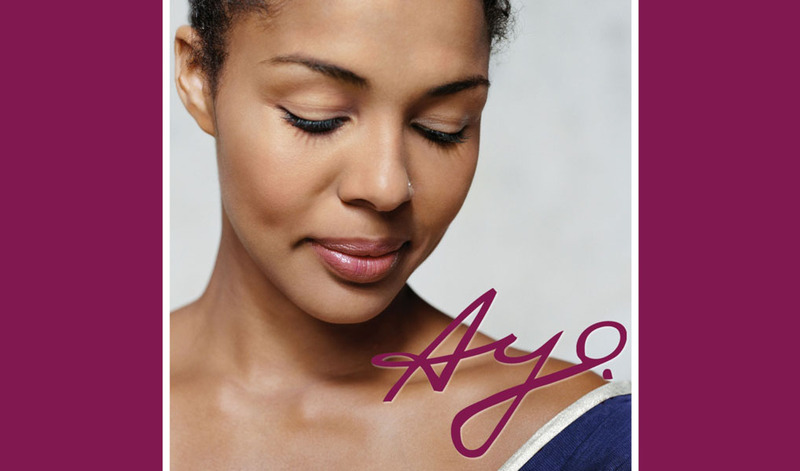 AYO is a German born artist, the offspring of a Nigerian father who had come to Germany to study in the 1970s, and sometimes worked as a DJ, and a mother who is a gypsy. AYOs rather unusual name means joy in Yoruba. Her rich cultural background is also reflected in her musical influences. She grew up amidst Pink Floyd and Fela Kuti, the Soul Children and Bob Marley, and many others. AYO’s nomadic lifestyle brought her to live between Paris and New York, two capitals that accurately sum up her musical identity. In Paris, word got around fast, and she held initial solo concerts with her guitar, opened for Omar, the British soul brother and jammed alongside Cody Chesnutt. AYOs entire album, Joyful, was recorded in New York under live conditions. She cries, laughs and moves us with her simplicity. To accompany her, producer Jay Newland put together a group of open-minded musicians that, with a note on a B3 organ or with a stroke of slide guitar melodiously enter this unusual world, which is studded with a few words in Pidgin, the street language of Lagos, and unveils recollections of gypsy life. In addition to her parents, two other influences helped her set the tone of this album, which very well could have been recorded some 35 years ago. Firstly, theres mentor Donny Hathaway. Her other reference is Jimmy Cliff. Like her predecessors, she strives to naturally and sincerely share her stories and touch others, boosted solely by her life experience and her dreams. Watch her video Help is coming which became instant favourite of mine. It is a reminiscent of Bob Marley’s hypnotic tunes and Lauryn hill’s vocals. As I was sampling Ayo’s music I also came across Nneka. Nneka was born Nneka Egbuna in a small town called Warri in Nigeria in 1981 and used to sing in her school’s and church choir in Nigeria. After relocating to Germany she’s been singing “professionally” for 5 years now. Her influences reflect her younger days in Nigeria as well as her time in the western world as she names famous compatriot Fela Kuti and legend Bob Marley as well as contemporary rappers Mos Def, Talib Kweli, Mobb Deep and Lauryn Hill. After gaining experiences good and bad with several producers and artists, she finally met DJ and Hip Hop Beatmaker, DJ Farhot (Hit Spot Productions) and they are working together for 2 years now. Before that she started hanging out with artists such as “Maskoe” and “The Chosen Few Crew” (Short Lord, Sensai Miyagie, Antonio, Seven 30 a.o.) and recorded songs with them. Subsequently they became her posse. Musically her songs range from deep soulful ballads like her “Confession” tune to modern reinventions of the UK sound, that “Massive Attack” once was popular for (“Changes”) to funk-driven Hip Hop tracks (“Stand Strong”). Even though she sings more than raps, she claims Hip Hop as her primary musical roots and an important source of her inspiration. You can call it Hip-hop Soul, if you want to, but as most real artist, Nneka doesn’t like labels. Even more important for her thoughtful lyrics are her origin and up bringing in Nigeria. “I get inspired when I take a severe look at the things going on in our world today; especially in my country. How people live, suffer and endure pain, politicians and religion. And when I see all that man has evoked and created out of self-centeredness and devotion to material things”, she rants. Watch her video African’s– A song that departs from the norm most reggae songs have taken. She takes it on with us Africans who blame our colonial fathers for the problems we face today. We need to wake up, stop sleeping and blaming. It’s Wicked. Nneka is also rumoured to be the next Lauryn Hill.